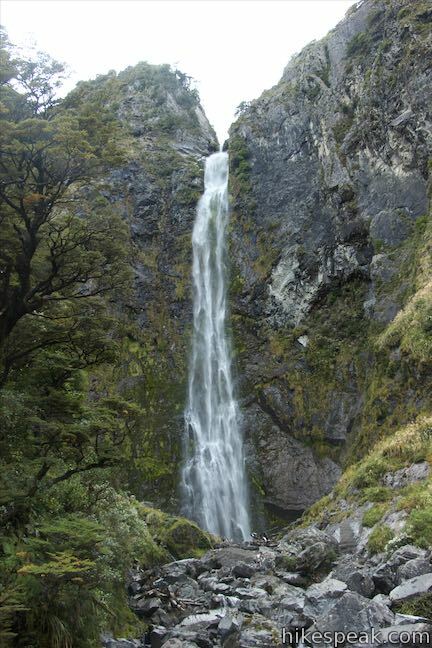 Devils Punchbowl Falls is a star attraction in Arthur’s Pass National Park. 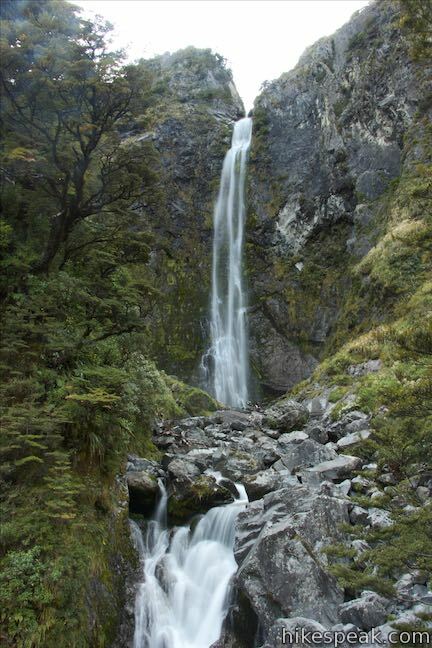 The dynamic waterfall plunges 131 meters into a canyon near Arthur’s Pass Village. 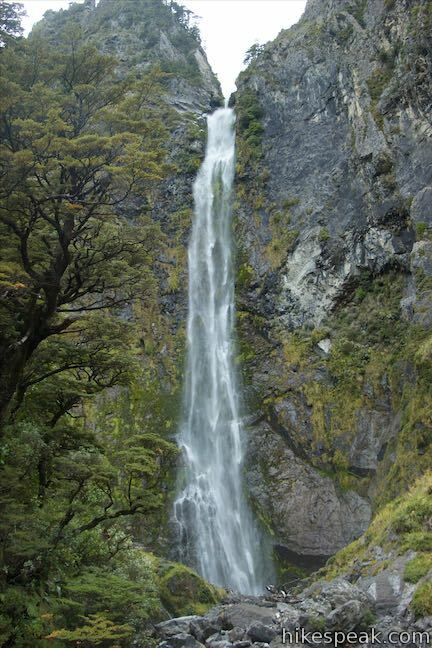 The area’s Māori named the waterfall Hinekakai, taking inspiration from its beautiful threads of water. 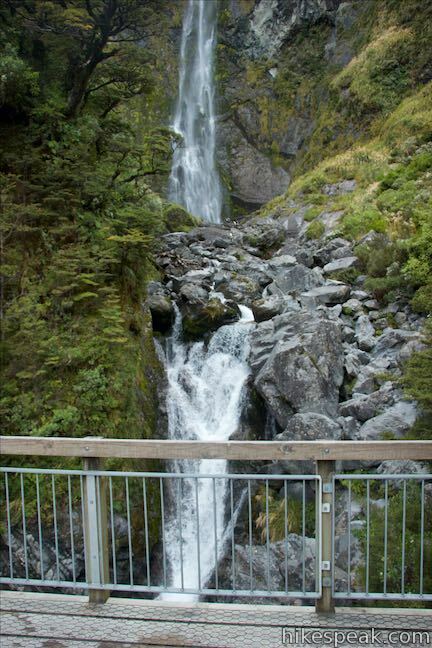 Visitors can reach the waterfall on a 2-kilometer (1.4-mile) round trip walk beginning from Arthur’s Pass Village. 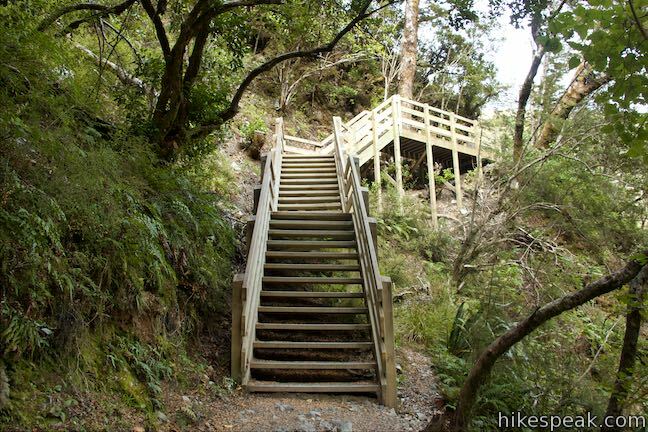 Devils Punchbowl Walking Trail crosses several staircases along the way to a viewing area below the falls, ascending 90 meters (295 feet) of elevation. 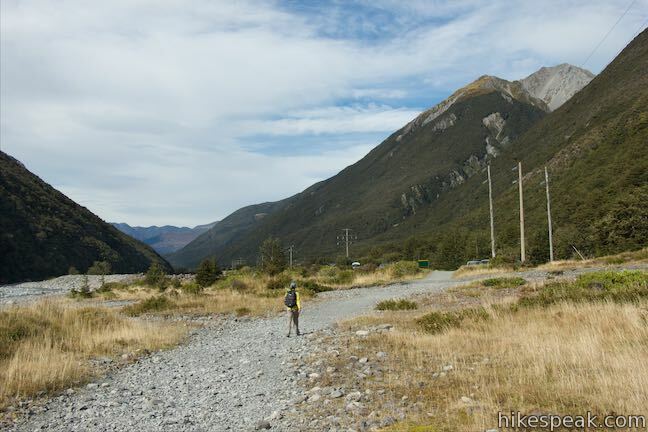 This hike starts from Punchbowl Car Park in Arthur’s Pass Village. 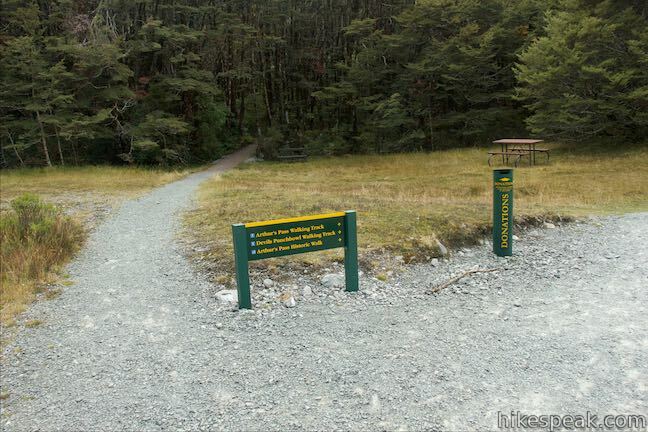 From State Highway 73 in the village, turn on to a gravel road leading to a parking area at the start of Arthur’s Pass Walking Track, which connects to Devils Punchbowl Walking Track after 250 meters. 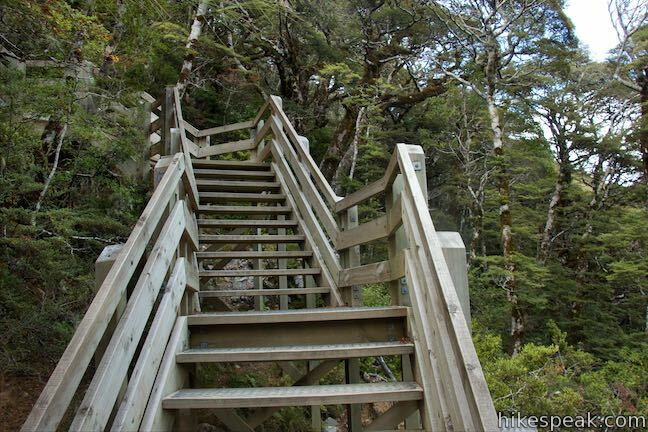 Head north from the convenient car park on a gravel trail that runs parallel to Bealey River. Ahead on the right, you’ll see two bridges on the route to Devils Punchbowl Falls. 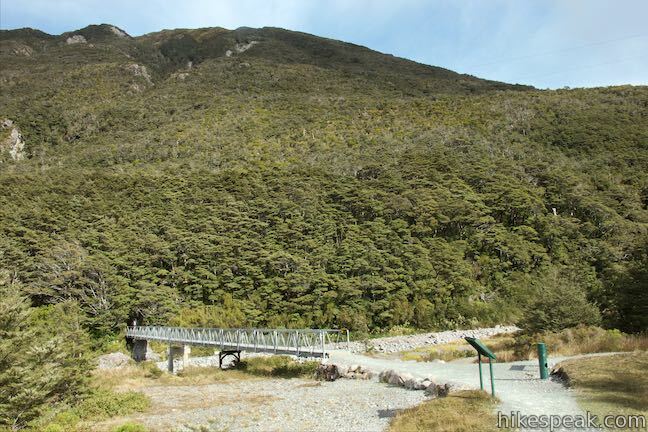 The first bridge, crossing Bealey River, is part of Arthur’s Pass Walking Track. 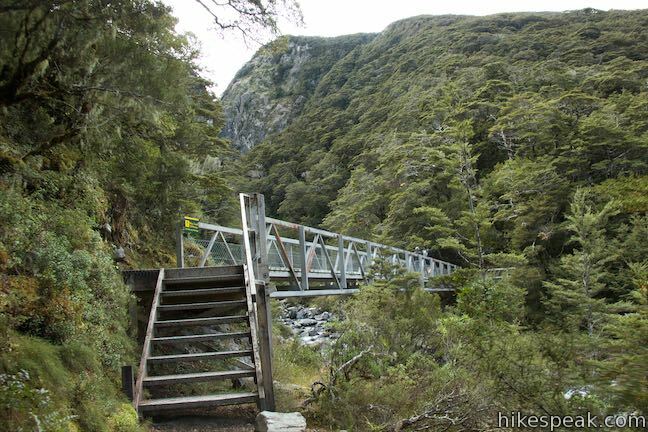 The second bridge crosses Devils Punchbowl Creek and is part of Devils Punchbowl Walking Track. A first look at Devils Punchbowl Falls can be spotted in the canyon above this bridge. Hike past a stone cabin on the left and slip through a bit of forest before turning right to cross Bealey Bridge to the east side of the river. In the middle of the metal bridge, take in the nice views up and down the river. On the other side, come to a junction that has an information panel and a picnic table. 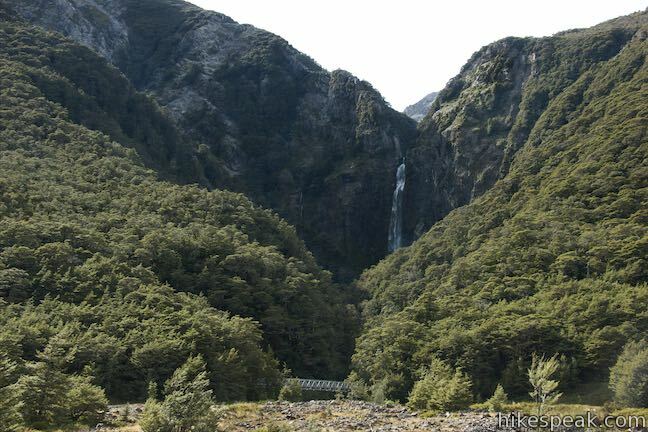 Arthur’s Pass Walking Track bears to the left, reaching Bridal Veil Falls Lookout after 650 meters before continuing on to Jacks Hut and Bealey Chasm Walk. 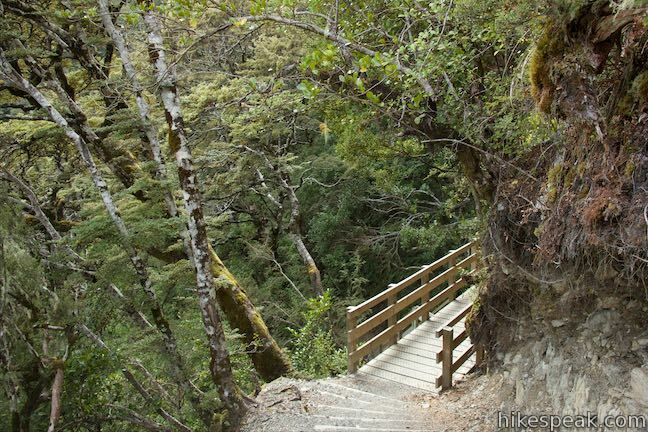 Make a right turn onto Devils Punchbowl Walking Track, which ascends 80 meters over the next 3/4 of a kilometer to the base of Devils Punchbowl Falls. 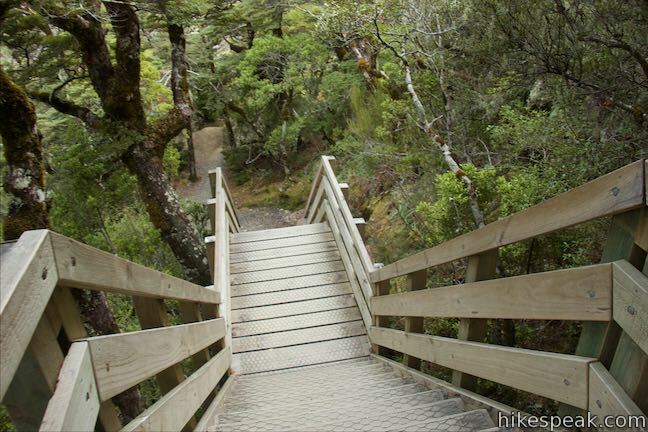 Hiking up Devils Punchbowl Walking Track, you’ll quickly come to Punchbowl Footbridge, which spans the creek below Devils Punchbowl Falls. 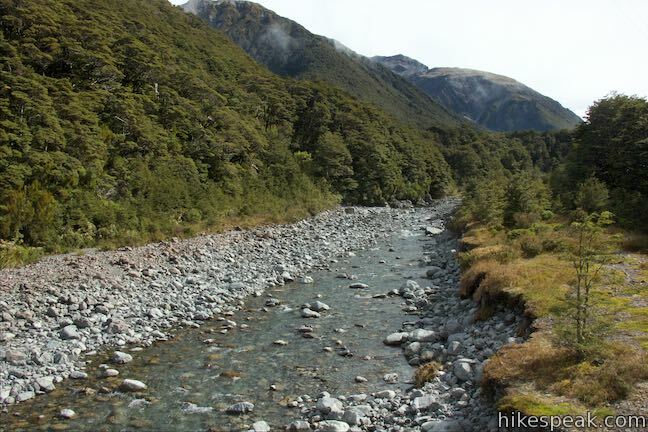 To your right, you can look downstream toward Arthur’s Pass Village. 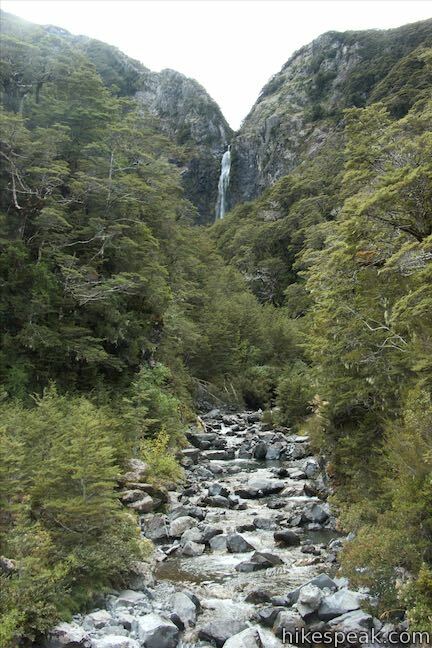 Look upstream to see the waterfall entering the canyon. Across the metal bridge, you’ll pass a spur on the right going to a historic power building. 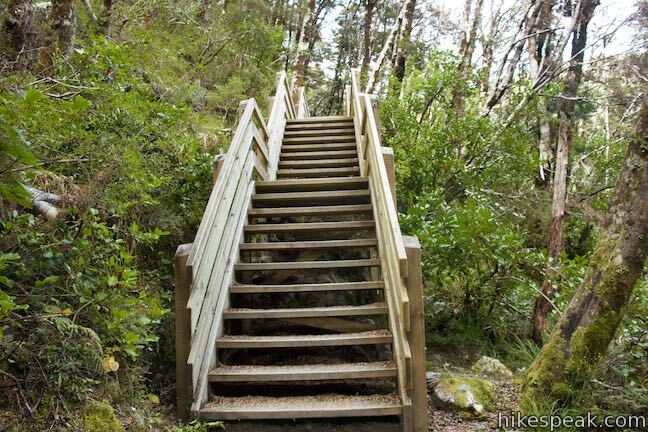 Proceed to the left up Devils Punchbowl Walking Track and begin the real ascent. 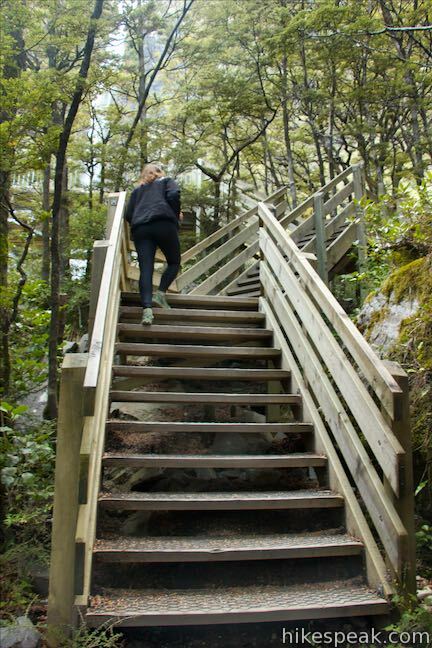 Several wooden staircases are built into the track as it climbs the ridge on the south side of the canyon cradling Devils Punchbowl Creek. 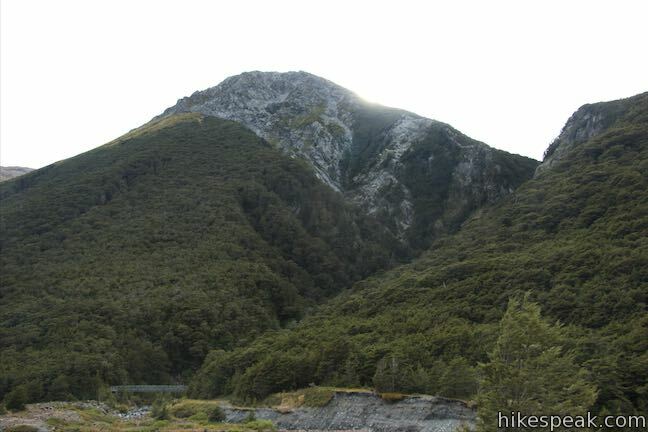 As you come to the top of one stretch of the climb, stay to the left through a junction with Aiken Track, a steep route that goes up Mount Aiken. Past the junction, Devils Punchbowl Walking Track goes downhill and curves into the canyon. Go up and down more staircases to make your way up the canyon toward the waterfall. 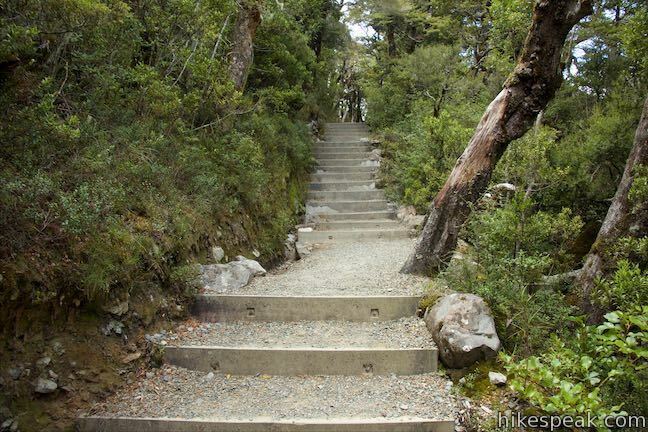 The track makes a final ascent up stone and wooden steps to a viewing platform that is raised a few meters off the ground. 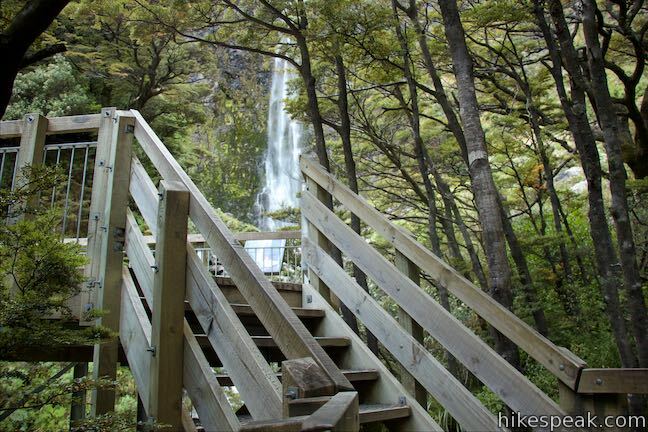 Stand behind wooden railings and take in an impressive perspective of Devils Punchbowl Falls. 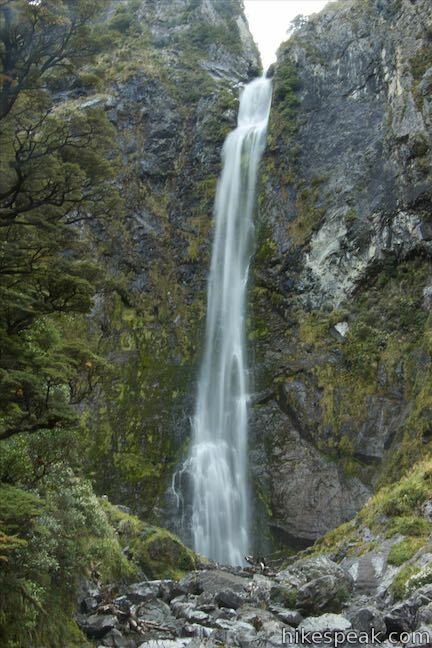 Devils Punchbowl Falls is a powerful beauty that drops 131 meters (430 feet). 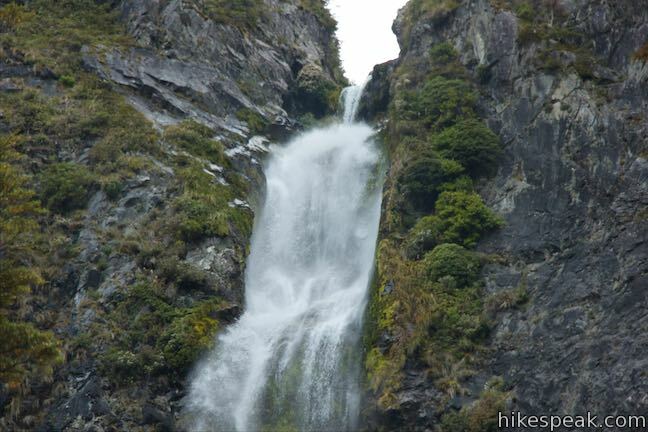 Water pinches through a cataract at the top of the waterfall, tumbles down a couple steps, and fans out to a width of a few meters as it courses down a wall of dark rock. 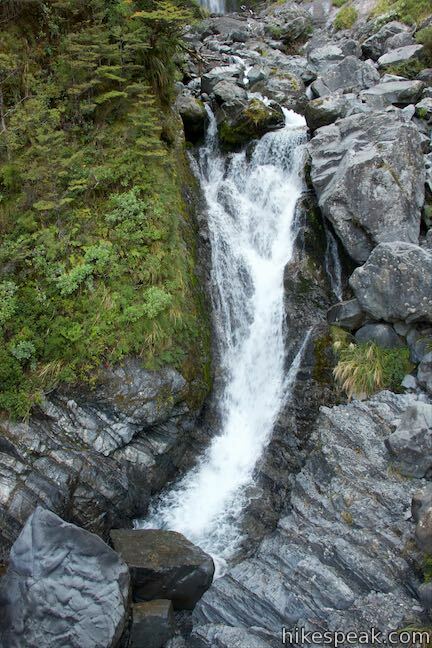 The canyon curls around the waterfall to give it an enclosed feel. 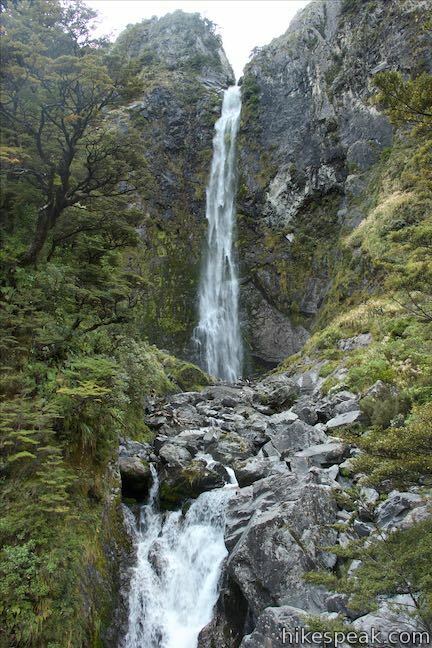 The viewpoint is below the base of the falls, so you can’t quite see any punchbowl pool below the waterfall. 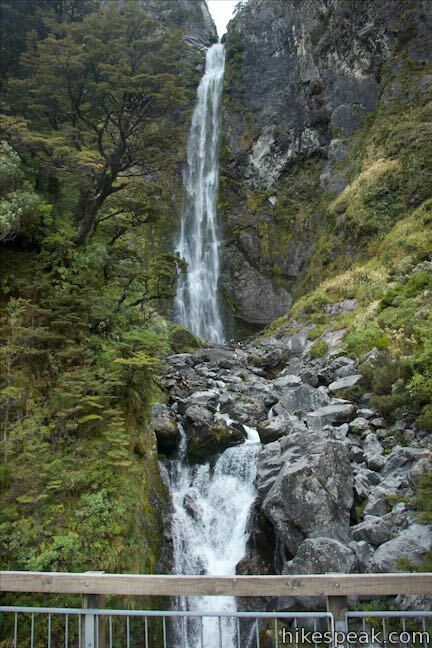 Under the waterfall, the creek eases through a boulder-covered area to reach a cascade right in front of the viewing platform. 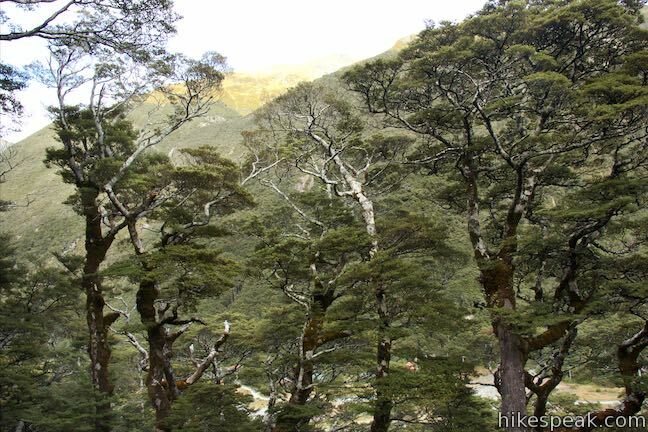 Māori associated natural features in the landscape with ancestors or their actions. 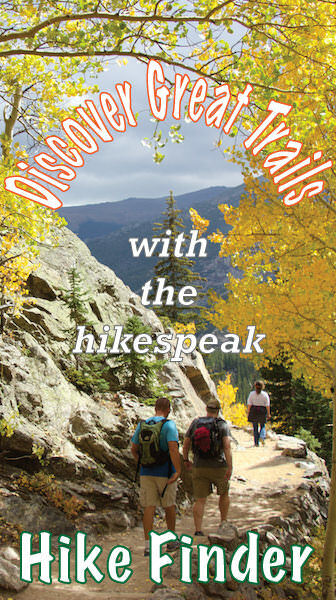 Their stories linked the people to the landscape and reflected the inseparable ties between the natural and human world. 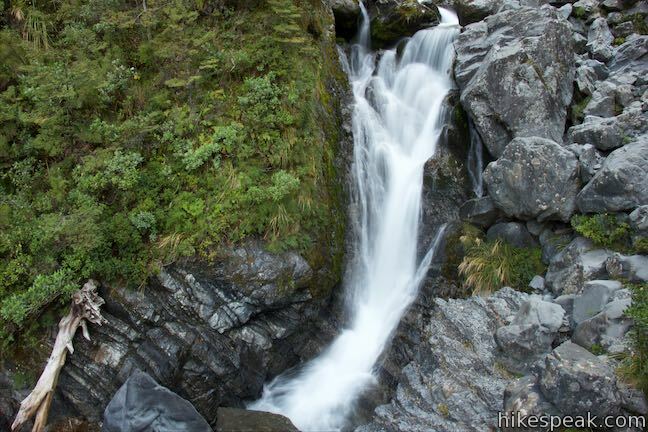 To Ngāi Tahu, these long intertwining threads of white water resembled the treads of dressed flax – whitau or muka – used to weave fine garments and mats. 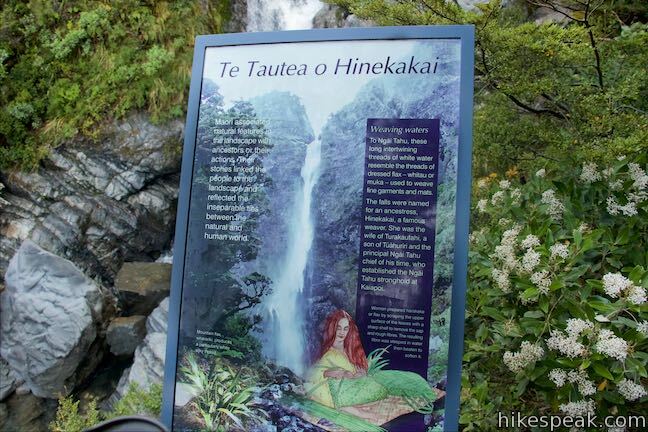 The falls were named for an ancestress, Hinekakai, a famous weaver. She was the wife of Turakautahi, as son of Tuahuriri and the principal Ngāi Tahu chief of his time, who established the Ngāi Tahu stronghold and Kaiapoi. 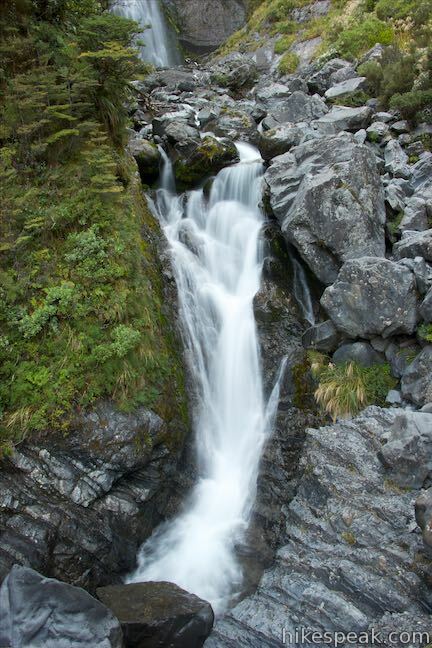 After taking in this bold and beautiful waterfall, venture back the way you came. 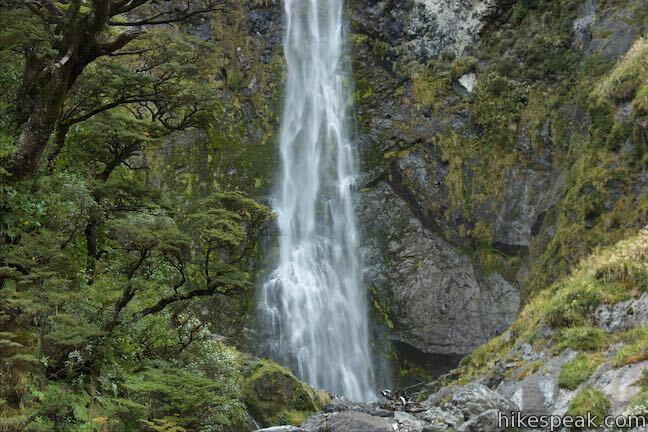 The hike to Devils Punchbowl Falls is 2 kilometers round trip with 90 meters of elevation change. 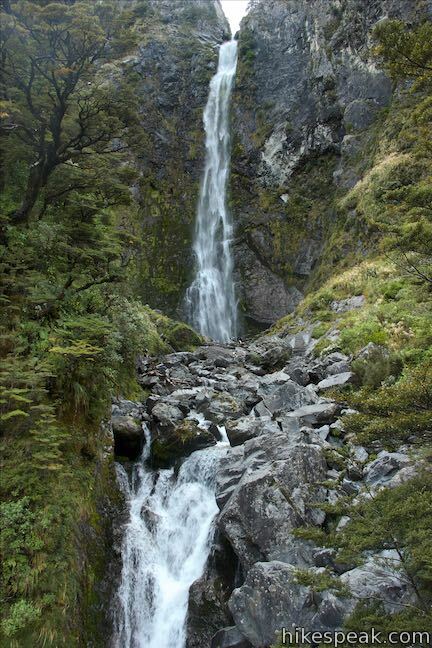 If you turn right on Arthur’s Pass Walking Track before crossing Bealey Bridge, you could hike up to Bridal Veil Falls Lookout to see a second waterfall and bring the total distance of the hike to 3.3 kilometers round trip. Bikes and dogs are not allowed. 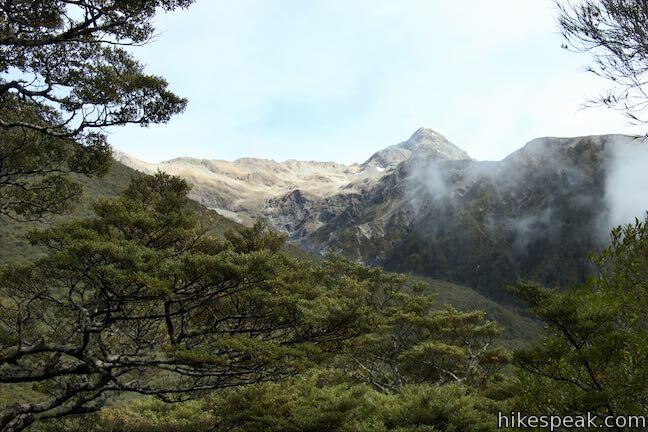 Arthur’s Pass National Park is free to visit and does not have an entrance fee. 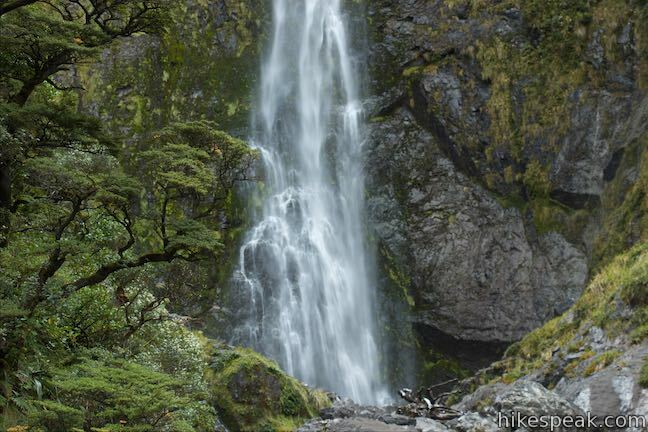 No permit is required to hike to Devils Punchbowl Falls, so get out and enjoy! Directions: From Sheffield (which is just over 50 kilometers west of Christchurch), take State Highway 73 northwest for 92.7 kilometers. 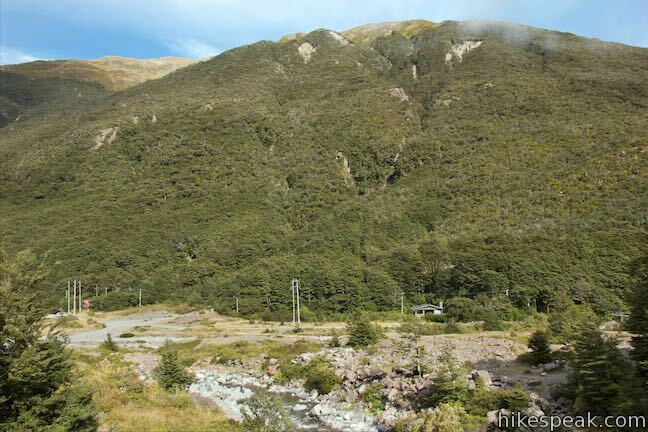 Drive into Arthur’s Pass Village and turn right onto Punchbowl Road. 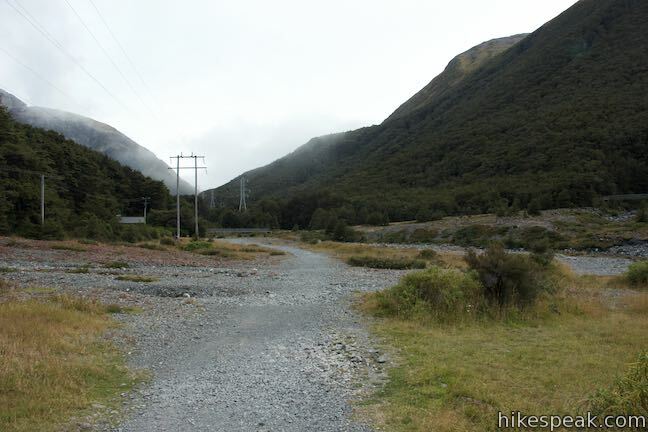 Pass a sign for Devils Punchbowl Track and Arthur’s Pass Walking Track and go down this gravel road to a car park where the trek begins. 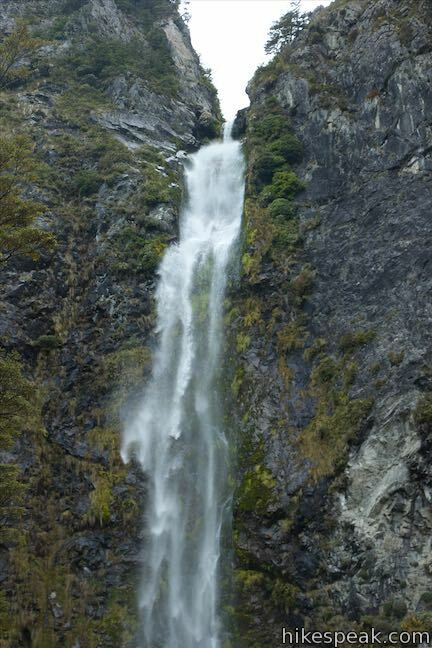 From Greymouth, on the west coast, drive south on State Highway 6 for 17 kilometers to Kumara Junction. 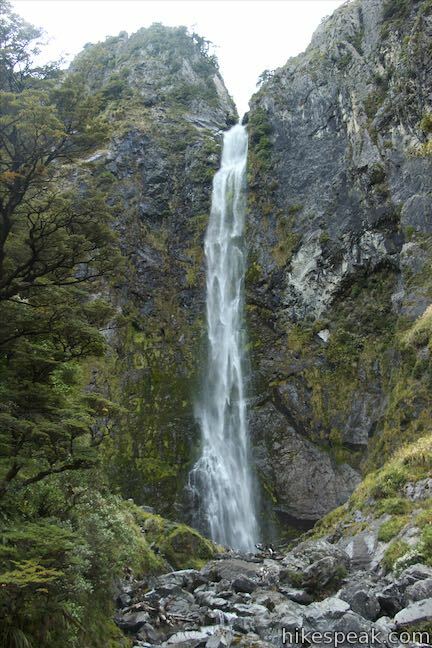 Turn inland on SH 73 and drive 77 kilometers southeast to Punchbowl Road. These photos were taken in March of 2014. Click to enlarge. 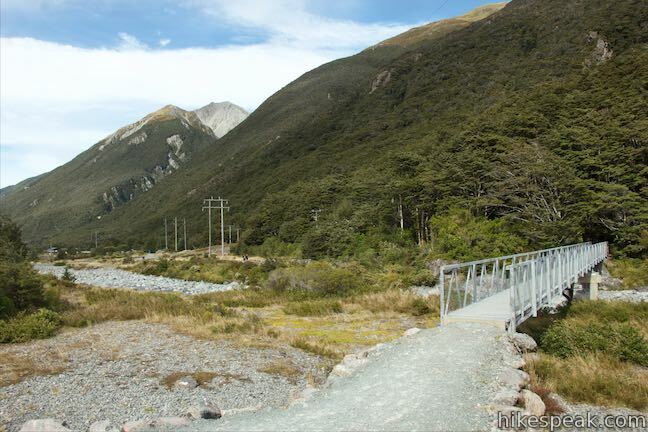 This 3.8-kilometer round trip hike ventures up a valley on the north side of Arthur's Pass, finding a footbridge over Otira River and broad views of surrounding mountains. 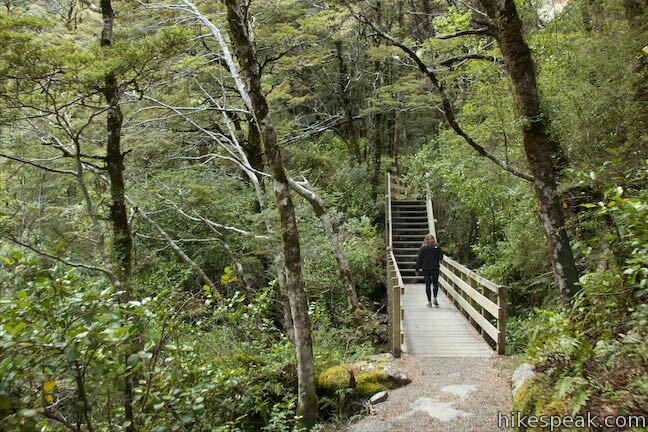 This short walk passes through moss-covered beech trees to a bridge over Bealey River where it slips through a ravine. 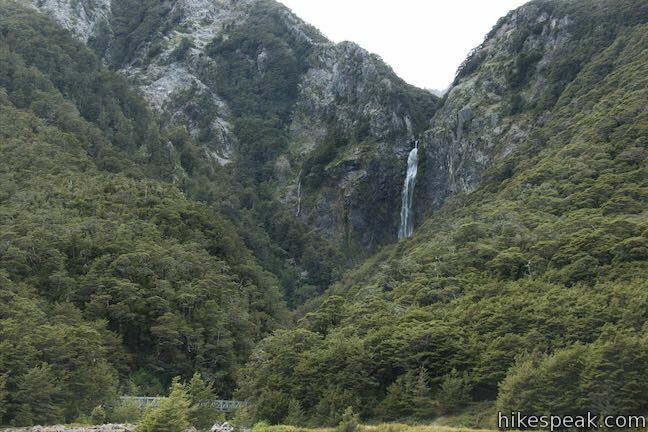 This 2.5-kilometer round trip hike on Arthur's Pass Walking Track crosses beech forests and alpine shrublands, dropping across a canyon to arrive at a view of Bridal Veil Falls. 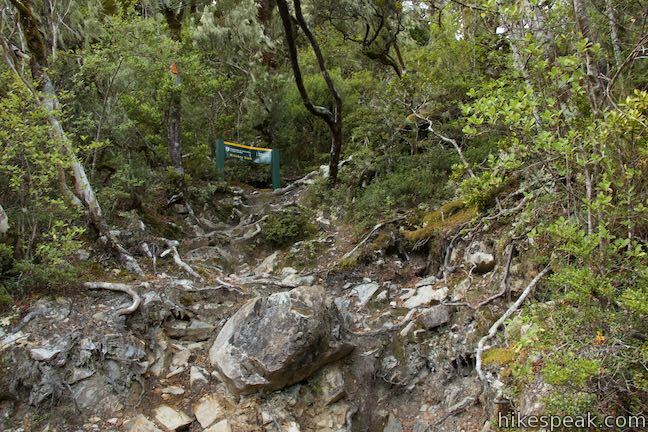 This 1.8 kilometer round trip hike up Arthur's Pass Walking Track takes a gradual approach to a viewpoint with a perspective of Bridal Veil Falls and surrounding mountains. 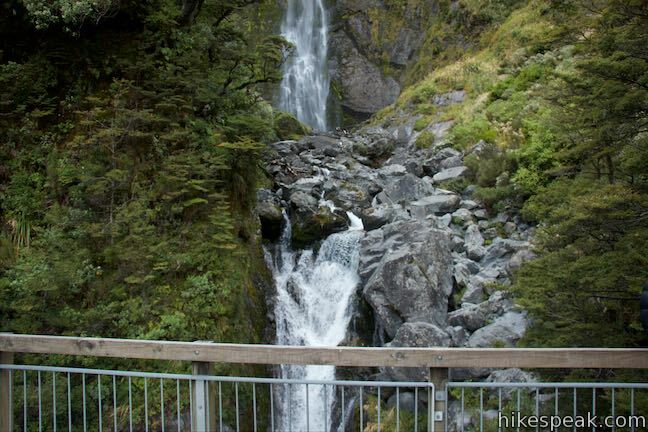 This 500-meter round trip walk goes from Arthur's Pass National Park Visitor Centre to a bridge and viewpoint below a waterfall on Avalanche Creek as it approaches Arthur's Pass Village. 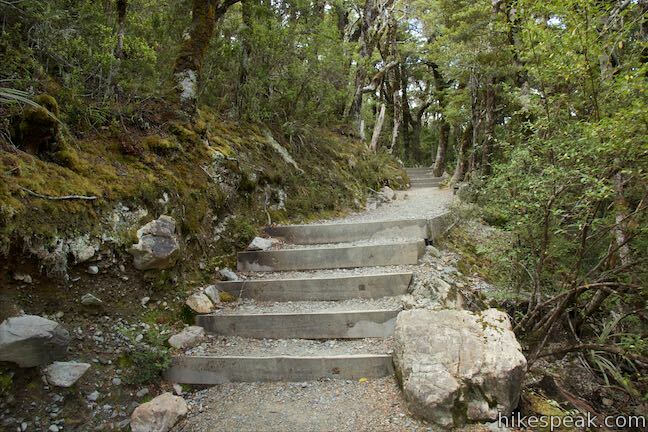 If you stay overnight at Greyneys Shelter Campground, start the day with this 1 to 1.4-kilometer loop that leaves the campground and travels through the surrounding forest along an old roadbed. 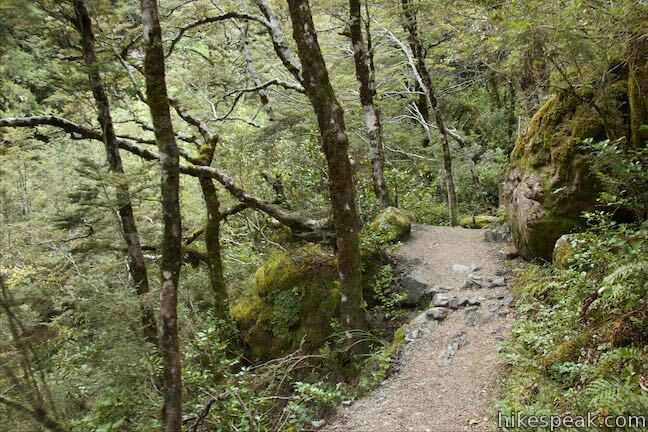 This 2 to 3-kilometer hike explores a fascinating jumble of limestone boulders close to Arthur's Pass National Park. 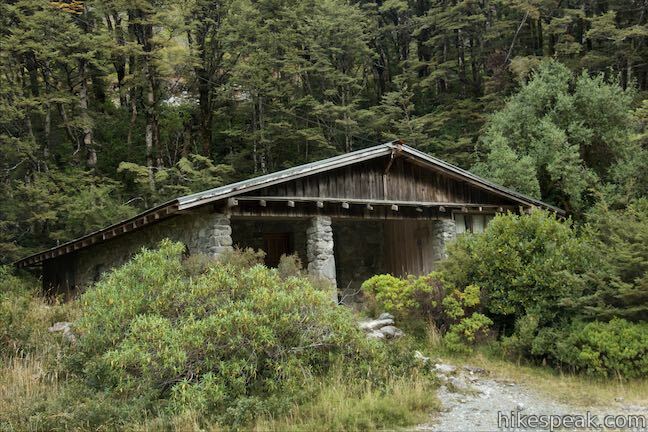 Camping is free around this small 3-wall stone shelter along State Highway 73 south of Arthur's Pass Village. 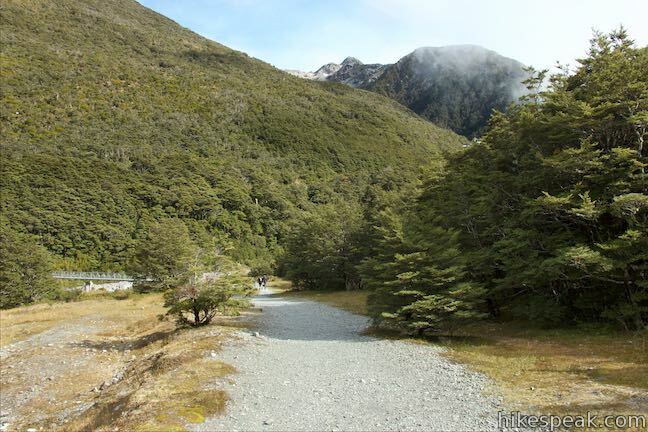 This 10-site campground in Arthur's Pass Village has a large shelter and easy access to the park visitor center and nearby hiking tracks. 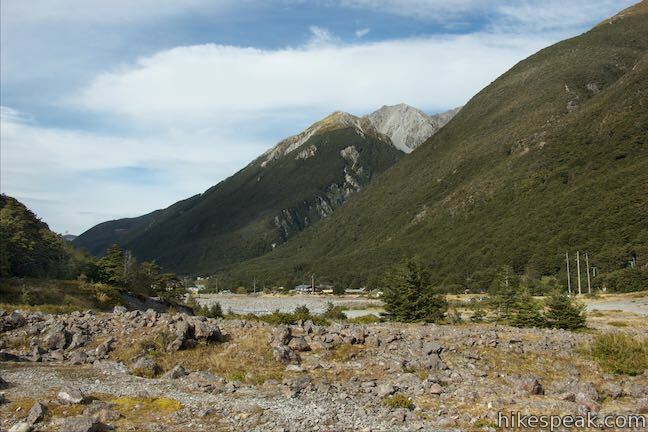 This lodging option in Arthur's Pass Village offers self-contained cabin accommodations that are convenient for visiting Arthur's Pass National Park. 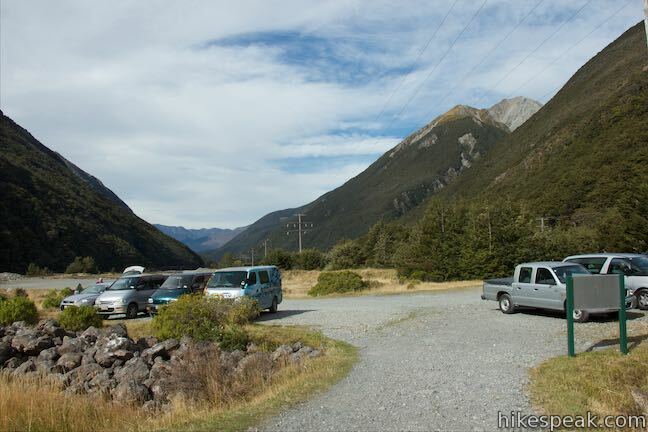 This campground has about 20 sites along the shore of a peaceful lake between mountains in the Canterbury Region near Arthur's Pass National Park.